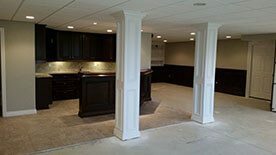 Depending on the type of work you want done, basement finishing can include a lot of different remodeling work which can be both time consuming and at times, costly that’s why it is important to speak to and have an expert take a look at your unfinished basement space. 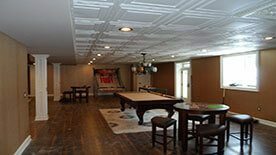 Consulting with an expert will help you determine the type of work that needs to be done on your basement to achieve the functionality and style that perfectly fits your family’s lifestyle and as an added benefit, a professional basement finishing contractor can help you determine the exact costs you’re looking at to finish your basement. To achieve that, one of the first questions we ask is how you intend to use your basement once it’s finished. Is it a completely livable space with separate entrance, coupled with a bathroom, bedroom and kitchen of its own? Is it just a recreation room for Saturday movie nights? Or maybe, just a basement bar for the boys? These things and more should be considered when planning your basement design. 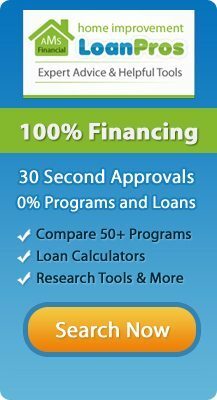 If you’re flipping a house or reselling your family home, it is best to invest first in a professionally finished basement to sell it fast and at a premium price. Our basement finishing services are just as ideal for home flippers and realtors as they are to homeowners in general. 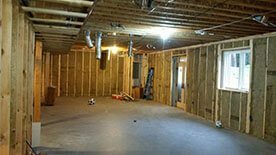 An unfinished basement lowers your home’s value; just imagine the amount of space wasted when it could be enhancing your homes equity! This and more proves that basement finishing is indeed a very smart decision. If on the other hand, say you’re having problems with leaks or molds on your basement, basement finishing can eliminate these issues for you so you can use your basement whatever way you may want to. 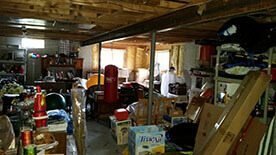 A leaky basement breeds mosquitoes and many different insects which can be hazardous to your family’s health and at times it even makes it impossible to use it as a storage room, a dry safe place for your treasures, of course is a much better option, not to mention the thousands of dollars you’re going to save on heating costs during cold Michigan winters. 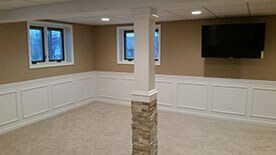 In short, investing in a high quality basement finishing project will save you more of your hard-earned cash in the long run than just by simply leaving your unfinished basement “as-is” which may result to mold damage or high cost of heating.